One of the most overlooked aspects of your lake or pond building project is establishing good grass cover to prevent erosion issues at the excavated site. Although unpleasant aesthetics is what most people notice first, soils washing into your newly constructed lake, pond or tank can cause serious water clarity problems along with the depth loss associated with water levels in the lake. Extensive silting of a project site can also result in problems downstream from the lake in and along the drainage areas. Costs to repair and correct the erosion damage can be significant. 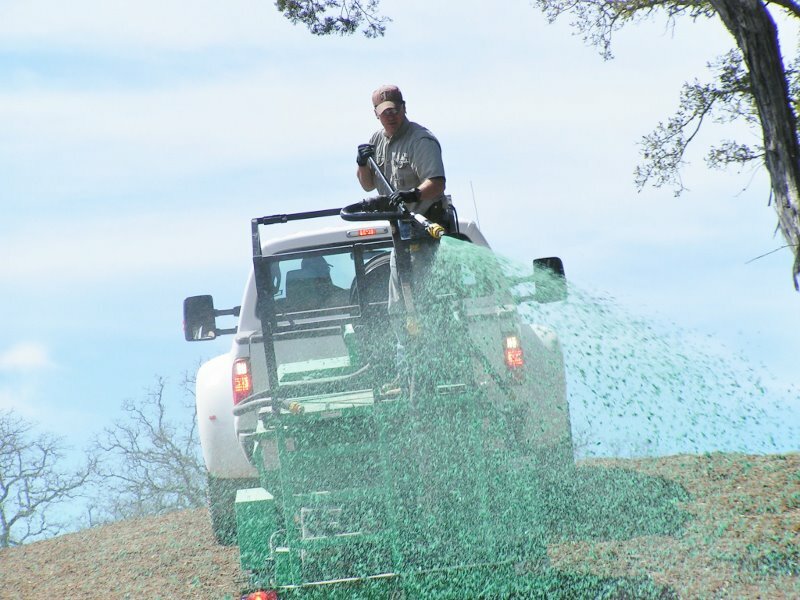 Your best defense against unwanted erosion, water clarity issues and unwanted silting in your new pond or lake is to make a strong effort to establish good grass cover on and around the site. In order to establish a good cover of grass you MUST have topsoil. Topsoil is considered to be a non-renewable resource because it takes Mother Nature approximately 100 years to make an inch of it. 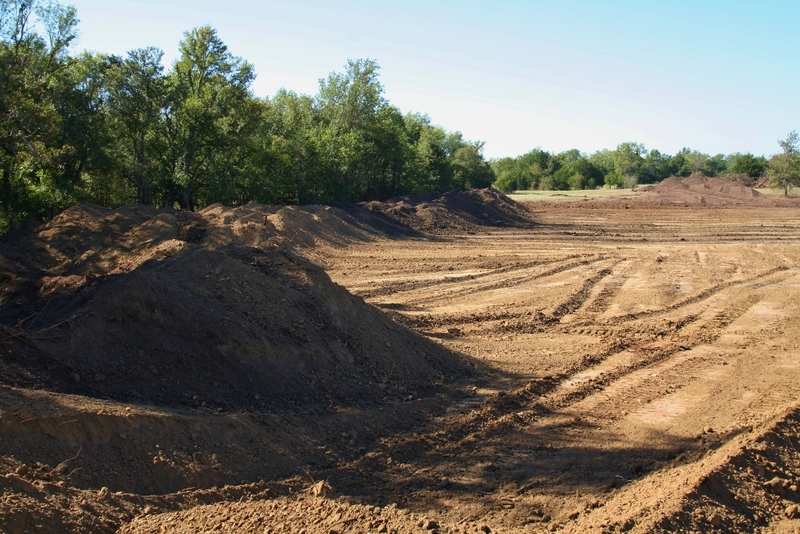 Consequently, topsoil is a precious commodity which is often completely neglected by the excavation contractor during your lake building project. Why is topsoil such an issue? One word, money. It costs money for the contractor to stockpile, save in a designated topsoil area and then reapply the topsoil across the newly excavated areas where grass is to be established. 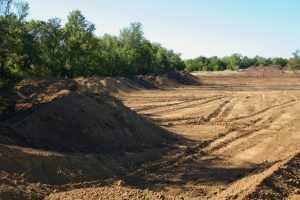 Most contractors and project management people tend to bypass proper topsoil handling techniques in favor of putting money in their pocket. Almost ALL of the landowners who will eventually suffer greatly and pay dearly for the topsoil rip-off never know that it is taking place until it is too late. I once did a preliminary consult for a fellow near College Station, Texas who ended up hiring a local contractor to build the project. A few months later, the client hired me again to re-visit the site and assess certain problems that were transpiring. After picking me up at a small local airport the landowner and I headed out to the site which was near a major 4 lane Texas highway. As we got closer to the site I noticed that the visibility along this major highway was very compromised by windblown dust whose source was obviously the client’s excavation site. 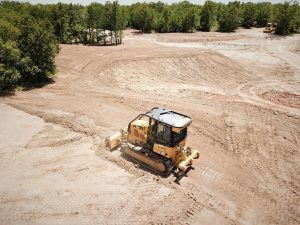 The client was concerned that the contractor had not saved and stockpiled enough clay to stabilize the shoreline of the lake, which he had not. The most pressing problem however was the seven plus acres of fertile grassland that had been covered with almost two feet of infertile spoils dirt (22,000 cubic yards) generated from the lake site. The client was clueless. When I asked this client where all of the top soil was he told me that the contractor said, “There wasn’t any topsoil”. The cost estimates to fix this topsoil blunder in even the most basic way was well over $150,000. Not a misprint -$150k! Another project, a 20+ acre site being constructed in highly erodible soils, was put on hold prior to completion due to an abnormally wet fall. The land owner was strongly advised to seed the entire site with rye grass so that soil erosion while the lake building project was idle over the winter would be minimized. The client elected to do zero seeding for reasons known only to him and an estimated 34,000 cubic yards of soil was lost from erosion. The cost alone of recovering the lost soil was estimated at almost $90K. At many consults regarding failed lake building projects it is obvious the landowners have not established good grass cover. When I ask them why, the answer is typically “I tried but I must not be a good enough farmer to grow grass”. As discussed earlier the main culprit is usually a lack of topsoil followed by improper seed selection, inadequate soil prep and improper timing. Inquire with the NRCS office (soil conservation service) in your area and gather info from university web sites about grass seeding and ground cover recommendations for your area. If I can be of service please contact Nick Jones of SoilMovers via email or phone.